Reflecting on a career spanning three decades, Luke Slater is a true dance music legend. The British producer has not only been pivotal in the rise of techno but his work continues to play a vital role in driving the genre forward, particularly under his Planetary Assault Systems name. Following its launch in 2006, Slater’s L.B.Dub Corp moniker has been responsible for refreshing house music on labels like Mote-Evolver and Ostgut Ton, with the latter hosting the pseudonym’s debut album in 2013. ‘Side Effects’ is the project’s first body of work since then. “I wrote the tracks over the last year between being on the road as P.A.S. 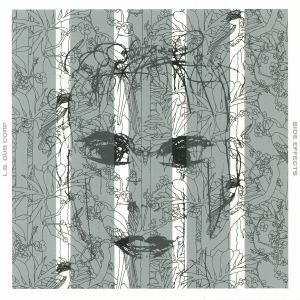 and playing a few L.B.Dub Corp house sets, which naturally evolved into ‘Side Effects’ almost accidentally” – Luke Slater Crashing stabs and a rolling hook inaugurate the album in ‘Reel One’ before the meandering ‘Night Time Hawk’ demonstrates effervescent effects and bursts of white noise. Commanding kicks and a moody bassline make up the robust ‘Edge 7’ whilst ‘IELBEE’ exhibits a bouncy aesthetic complete with intricate melodies. ‘Float When You Can’ is dark and ominous from the off but an echoing note sequence adds a glimmer of light, making way for the reverberating mechanics of ‘Bass Machine’ before leading into the twisted sounds and ghostly air of ‘Forever In A Day’. Nearing the end, ‘LBEES Jam’ is the most lighthearted track on the album with its twinkling lead melody until Slater rounds off the release with a soulful and vocal driven affair ‘All Got To Live’.